A relief worker who responded to this collapse in Kensington said it reminded her of the damage from Haiti's 2010 earthquake. REMEMBER THIS time last year? Philadelphia was crumbling. At least eight buildings collapsed within a month. Early Saturday morning, a Kensington house completely collapsed, injuring one resident. A dog is believed to have died. Six hours later, firefighters responded to a vacant property in Mantua, where the front two-thirds of the structure had collapsed. By midafternoon, it was raining bricks on South Street because of a partial facade collapse at Domino's Pizza. Those collapses coincided with Saturday's preview of the memorial planned at 22nd and Market streets, where a botched demolition killed six people in June 2013, with a seventh dying three weeks later. A replica was unveiled to the victims' families. 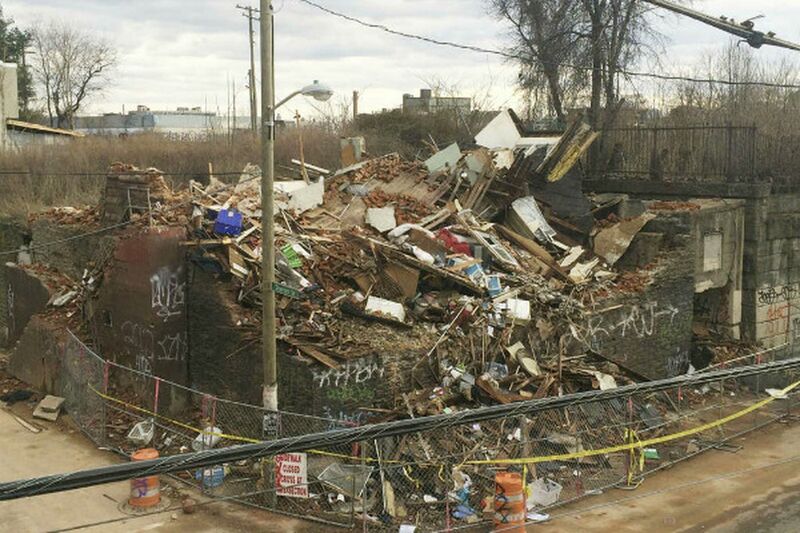 Last week, L&I responded to three other building collapses, including a partial roof collapse at an apartment complex in East Mount Airy, before Saturday's trio, Williams said. Jennifer Leary, a former firefighter and founder of Red Paw Emergency Relief Team, responded to the Kensington house at Sterner and Emerald streets, where a 43-year-old resident was taken to Temple University Hospital after the building crumbled about 4:45 a.m.
"I went to Haiti right after the earthquake, and that's what it looked like," Leary said. "Crazy." Leary said her group rescued the man's dog and a cat that was trying to get back into the rubble that she believes belongs to him. "What I was told by L&I is that he had gotten up in the middle of the night to go to the bathroom and as he was in the second-floor bathroom, the house collapsed," she said. "From what I saw and from what L&I told me, it's a miracle he survived." The man's name has not been released. His Chihuahua is missing and presumed dead. "We call him Gringo," Keisha Santaella, who lives across the street, said of her neighbor. "One of his dogs made it out, but the other didn't. The Chihuahua didn't." No injuries were reported in the Saturday's other collapses, on Union Street near Mount Vernon, and on South Street near 7th.